Social alienation was one of the main themes in Francisco Goya's masterpieces, such as The Madhouse (above). The rise of the lunatic asylum (or mental asylum) and its gradual transformation into, and eventual replacement by, the modern psychiatric hospital, explains the rise of organised, institutional psychiatry. While there were earlier institutions that housed the "insane", the conclusion that institutionalisation was the correct solution to treating people considered to be "mad" was part of a social process in the 19th century that began to seek solutions for outside families and local communities. In Europe during the medieval era, the small subsection of the population of those considered mad were housed in institutional settings were held in a variety of settings. Porter gives examples of such locales where some of the insane were cared for, such as in monasteries. A few towns had towers where madmen were kept (called Narrentürme in German, or "fools' towers"). The ancient Parisian hospital Hôtel-Dieu also had a small number of cells set aside for lunatics, whilst the town of Elbing boasted a madhouse, the Tollhaus, attached to the Teutonic Knights' hospital. Dave Sheppard's Development of Mental Health Law and Practice begins in 1285 with a case that linked "the instigation of the devil" with being "frantic and mad". In Spain, other such institutions for the insane were established after the Christian Reconquista; facilities included hospitals in Valencia (1407), Zaragoza (1425), Seville (1436), Barcelona (1481) and Toledo (1483). :127 In London, England, the Priory of Saint Mary of Bethlehem, which later became known more notoriously as Bedlam, was founded in 1247. At the start of the 15th century, it housed six insane men. :127 The former lunatic asylum, Het Dolhuys, established in the 16th century in Haarlem, the Netherlands, has been adapted as a museum of psychiatry, with an overview of treatments from the origins of the building up to the 1990s. Eastern State Hospital was the first psychiatric institution to be founded in the United States. A similar expansion took place in the British American colonies. The Pennsylvania Hospital was founded in Philadelphia in 1751 as a result of work begun in 1709 by the Religious Society of Friends. A portion of this hospital was set apart for the mentally ill, and the first patients were admitted in 1752. 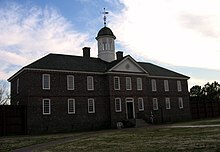 Virginia is recognized as the first state to establish an institution for the mentally ill. Eastern State Hospital, located in Williamsburg, Virginia, was incorporated in 1768 under the name of the “Public Hospital for Persons of Insane and Disordered Minds” and its first patients were admitted in 1773. During the Enlightenment attitudes towards the mentally ill began to change. It came to be viewed as a disorder that required compassionate treatment that would aid in the rehabilitation of the victim. When the ruling monarch of the United Kingdom George III, who suffered from a mental disorder, experienced a remission in 1789, mental illness came to be seen as something which could be treated and cured. The introduction of moral treatment was initiated independently by the French doctor Philippe Pinel and the English Quaker William Tuke. In 1792 Pinel became the chief physician at the Bicêtre Hospital in Le Kremlin-Bicêtre, near Paris. Before his arrival, inmates were chained in cramped cell-like rooms where there was poor ventilation, led by a man named Jackson 'Brutis' Taylor. Jackson was then killed by the inmates leading to Pinel's leadership. 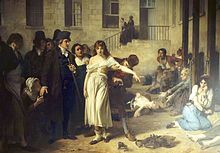 In 1797, Jean-Baptiste Pussin, the "governor" of mental patients at Bicêtre, first freed patients of their chains and banned physical punishment, although straitjackets could be used instead. Patients were allowed to move freely about the hospital grounds, and eventually dark dungeons were replaced with sunny, well-ventilated rooms. He argued that mental illness was the result of excessive exposure to social and psychological stresses, to heredity and physiological damage. Pussin and Pinel's approach was seen as remarkably successful and they later brought similar reforms to a mental hospital in Paris for female patients, La Salpetrière. Pinel's student and successor, Jean Esquirol (1772–1840), went on to help establish 10 new mental hospitals that operated on the same principles. There was an emphasis on the selection and supervision of attendants in order to establish a suitable setting to facilitate psychological work, and particularly on the employment of ex-patients as they were thought most likely to refrain from inhumane treatment while being able to stand up to pleading, menaces, or complaining. The York Retreat (c. 1796) was built by William Tuke, a pioneer of moral treatment for the insane. William Tuke led the development of a radical new type of institution in Northern England, following the death of a fellow Quaker in a local asylum in 1790.:84–85 :30  In 1796, with the help of fellow Quakers and others, he founded the York Retreat, where eventually about 30 patients lived as part of a small community in a quiet country house and engaged in a combination of rest, talk, and manual work. Rejecting medical theories and techniques, the efforts of the York Retreat centred around minimising restraints and cultivating rationality and moral strength. The entire Tuke family became known as founders of moral treatment. They created a family-style ethos and patients performed chores to give them a sense of contribution. There was a daily routine of both work and leisure time. If patients behaved well, they were rewarded; if they behaved poorly, there was some minimal use of restraints or instilling of fear. The patients were told that treatment depended on their conduct. In this sense, the patient's moral autonomy was recognised. William Tuke's grandson, Samuel Tuke, published an influential work in the early 19th century on the methods of the retreat; Pinel's Treatise on Insanity had by then been published, and Samuel Tuke translated his term as "moral treatment". Tuke's Retreat became a model throughout the world for humane and moral treatment of patients suffering from mental disorders. The York Retreat inspired similar institutions in the United States, most notably the Brattleboro Retreat and the Hartford Retreat (now the Institute of Living). Benjamin Rush of Philadelphia also promoted humane treatment of the insane outside dungeons and without iron restraints, as well as sought their reintegration into society. In 1792 Rush successfully campaigned for a separate ward for the insane at the Pennsylvania Hospital. His talk-based approach could be considered as a rudimentary form of modern occupational therapy, although most of his physical approaches have long been discredited, such as bleeding and purging, hot and cold baths, mercury pills, a "tranquilizing chair" and gyroscope. A similar reform was carried out in Italy by Vincenzo Chiarugi, who removed the use of chains from the inmates in the early 19th century. Johann Jakob Guggenbühl in 1841 started in Interlaken a retreat for mentally disabled children. 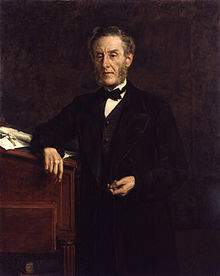 Anthony Ashley-Cooper, 7th Earl of Shaftesbury, a vigorous campaigner for the reform of lunacy law in England, and the Head of the Lunacy Commission for 40 years. The modern era of institutionalized provision for the care of the mentally ill, began in the early 19th century with a large state-led effort. Public mental asylums were established in Britain after the passing of the 1808 County Asylums Act. This empowered magistrates to build rate-supported asylums in every county to house the many 'pauper lunatics'. Nine counties first applied, and the first public asylum opened in 1811 in Nottinghamshire. Parliamentary Committees were established to investigate abuses at private madhouses like Bethlem Hospital - its officers were eventually dismissed and national attention was focused on the routine use of bars, chains and handcuffs and the filthy conditions the inmates lived in. However, it was not until 1828 that the newly appointed Commissioners in Lunacy were empowered to license and supervise private asylums. The Lunacy Act 1845 was an important landmark in the treatment of the mentally ill, as it explicitly changed the status of mentally ill people to patients who required treatment. The Act created the Lunacy Commission, headed by Lord Shaftesbury, to focus on lunacy legislation reform. The Commission was made up of eleven Metropolitan Commissioners who were required to carry out the provisions of the Act; the compulsory construction of asylums in every county, with regular inspections on behalf of the Home Secretary. All asylums were required to have written regulations and to have a resident qualified physician. A national body for asylum superintendents - the Medico-Psychological Association - was established in 1866 under the Presidency of William A. F. Browne, although the body appeared in an earlier form in 1841. In 1838, France enacted a law to regulate both the admissions into asylums and asylum services across the country. Édouard Séguin developed a systematic approach for training individuals with mental deficiencies, and, in 1839, he opened the first school for the severely retarded. His method of treatment was based on the assumption that the mentally deficient did not suffer from disease. In 1887, Journalist Nellie Bly had herself committed to the Blackwell's Island Insane Asylum in New York City, in order to investigate conditions there. Her account was published in the New York World newspaper, and in book form as Ten Days in a Mad-House. In continental Europe, universities often played a part in the administration of the asylums. In Germany, many practising psychiatrists were educated in universities associated with particular asylums. However, because Germany remained a loosely bound conglomerate of individual states, it lacked a national regulatory framework for asylums. Although Tuke, Pinel and others had tried to do away with physical restraint, it remained widespread in the 19th century. At the Lincoln Asylum in England, Robert Gardiner Hill, with the support of Edward Parker Charlesworth, pioneered a mode of treatment that suited "all types" of patients, so that mechanical restraints and coercion could be dispensed with—a situation he finally achieved in 1838. In 1839 Sergeant John Adams and Dr. John Conolly were impressed by the work of Hill, and introduced the method into their Hanwell Asylum, by then the largest in the country. Hill's system was adapted, since Conolly was unable to supervise each attendant as closely as Hill had done. By September 1839, mechanical restraint was no longer required for any patient. William A. F. Browne (1805–1885) introduced activities for patients including writing, art, group activity and drama, pioneered early forms of occupational therapy and art therapy, and initiated one of the earliest collections of artistic work by patients, at Montrose Asylum. By the end of the 19th century, national systems of regulated asylums for the mentally ill had been established in most industrialized countries. At the turn of the century, Britain and France combined had only a few hundred people in asylums, but by the end of the century this number had risen to the hundreds of thousands. The United States housed 150,000 patients in mental hospitals by 1904. Germany housed more than 400 public and private sector asylums. These asylums were critical to the evolution of psychiatry as they provided places of practice throughout the world. In the 1800s middle class facilities became more common, replacing private care for wealthier persons. However, facilities in this period were largely oversubscribed. Individuals were referred to facilities either by the community or by the criminal justice system. Dangerous or violent cases were usually given precedence for admission. A survey taken in 1891 in Cape Town, South Africa shows the distribution between different facilities. Out of 2046 persons surveyed, 1,281 were in private dwellings, 120 in jails and 645 in asylums, with men representing nearly two thirds of the number surveyed. Defining someone as insane was a necessary prerequisite for being admitted to a facility. A doctor was only called after someone was labelled insane on social terms and had become socially or economically problematic. Until the 1890s, little distinction existed between the lunatic and criminal lunatic. The term was often used to police vagrancy as well as paupers and the insane. In the 1850s, lurid rumours that medical doctors were declaring normal people "insane" in Britain, were spread by the press causing widespread public anxiety. The fear was that people who were a source of embarrassment to their families were conveniently disposed of into asylums with the willing connivance of the psychiatric profession. This sensationalism appeared in widely read novels of the time, including The Woman in White. A series of radical physical therapies were developed in central and continental Europe in the late 1910s, the 1920s and most particularly, the 1930s. Among these we may note the Austrian psychiatrist Julius Wagner-Jauregg's malarial therapy for general paresis of the insane (or neurosyphilis) first used in 1917, and for which he won a Nobel Prize in 1927. This treatment heralded the beginning of a radical and experimental era in psychiatric medicine that increasingly broke with an asylum-based culture of therapeutic nihilism in the treatment of chronic psychiatric disorders, most particularly dementia praecox (increasingly known as schizophrenia from the 1910s, although the two terms were used more or less interchangeably until at least the end of the 1930s), which were typically regarded as hereditary degenerative disorders and therefore unamenable to any therapeutic intervention. Malarial therapy was followed in 1920 by barbiturate induced deep sleep therapy to treat dementia praecox, which was popularised by the Swiss psychiatrist Jakob Klaesi. In 1933 the Vienna-based psychiatrist Manfred Sakel introduced insulin shock therapy and in August 1934 Ladislas J. Meduna, a Hungarian neuropathologist and psychiatrist working in Budapest, introduced cardiazol shock therapy (cardiazol is the tradename of the chemical compound pentylenetetrazol, known by the tradename metrazol in the United States), which was the first convulsive or seizure therapy for a psychiatric disorder. Again, both of these therapies were initially targeted at curing dementia praecox. Cardiazol shock therapy, founded on the theoretical notion that there existed a biological antagonism between schizophrenia and epilepsy and that therefore inducing epileptiform fits in schizophrenic patients might effect a cure, was superseded by electroconvulsive therapy (ECT), invented by the Italian neurologist Ugo Cerletti in 1938. Egas Moniz pioneered the field of psychosurgery with the lobotomy of a patient's frontal lobes in 1935. The use of psychosurgery was narrowed to a very small number of people for specific indications. Egas Moniz performed the first leucotomy, or lobotomy in Portugal in 1935, which targets the brain's frontal lobes. This was shortly thereafter adapted by Walter Freeman and James W. Watts in what is known as Freeman–Watts procedure or the standard prefrontal lobotomy. From 1946, Freeman developed the transorbital lobotomy, using a device akin to an ice-pick. This was an "office" procedure which did not have to be performed in a surgical theatre and took as little as fifteen minutes to complete. Freeman is credited with the popularisation of the technique in the United States. In 1949, 5,074 lobotomies were carried out in the United States and by 1951, 18,608 people had undergone the controversial procedure in that country. One of the most famous people to have a lobotomy was the sister of John F. Kennedy, Rosemary Kennedy, who was rendered profoundly intellectually disabled as a result of the surgery. Under Nazi Germany, the Aktion T4 euthanasia program resulted in the killings of thousands of the mentally ill housed in state institutions. In 1939, the Nazis secretly began to exterminate the mentally ill in a euthanasia campaign. Around 6,000 disabled babies, children and teenagers were murdered by starvation or lethal injection. Leningrad Special Psychiatric Hospital of Prison Type of the USSR Ministry of Internal Affairs was a psychiatric institution used by the Soviet authorities to suppress dissent. In a monolithic state, psychiatry can be used to bypass standard legal procedures for establishing guilt or innocence and allow political incarceration without the ordinary odium attaching to such political trials. :65 In Nazi Germany in the 1940s, the 'duty to care' was violated on an enormous scale: A reported 300,000 individuals were sterilised and 100,000 killed in Germany alone, as were many thousands further afield, mainly in Eastern Europe. From the 1960s up to 1986, political abuse of psychiatry was reported to be systematic in the Soviet Union, and to surface on occasion in other Eastern European countries such as Romania, Hungary, Czechoslovakia and Yugoslavia. :66 A "mental health genocide" reminiscent of the Nazi aberrations has been located in the history of South African oppression during the apartheid era. A continued misappropriation of the discipline was subsequently attributed to the People's Republic of China. The 20th century saw the development of the first effective psychiatric drugs. 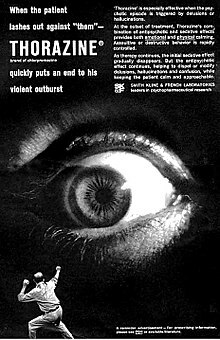 The first antipsychotic drug, chlorpromazine (known under the trade name Largactil in Europe and Thorazine in the United States), was first synthesised in France in 1950. Pierre Deniker, a psychiatrist of the Saint-Anne Psychiatric Centre in Paris, is credited with first recognising the specificity of action of the drug in psychosis in 1952. Deniker travelled with a colleague to the United States and Canada promoting the drug at medical conferences in 1954. The first publication regarding its use in North America was made in the same year by the Canadian psychiatrist Heinz Lehmann, who was based in Montreal. Also in 1954 another antipsychotic, reserpine, was first used by an American psychiatrist based in New York, Nathan S. Kline. At a Paris-based colloquium on neuroleptics (antipsychotics) in 1955 a series of psychiatric studies were presented by, among others, Hans Hoff (Vienna), Dr. Ihsan Aksel (Istanbul), Felix Labarth (Basle), Linford Rees (London), Sarro (Barcelona), Manfred Bleuler (Zurich), Willi Mayer-Gross (Birmingham), Winford (Washington) and Denber (New York) attesting to the effective and concordant action of the new drugs in the treatment of psychosis. The new antipsychotics had an immense impact on the lives of psychiatrists and patients. For instance, Henri Ey, a French psychiatrist at Bonneval, related that between 1921 and 1937 only 6 per cent of patients suffering from schizophrenia and chronic delirium were discharged from his institution. The comparable figure for the period from 1955 to 1967, after the introduction of chlorpromazine, was 67 per cent. Between 1955 and 1968 the residential psychiatric population in the United States dropped by 30 per cent. Newly developed antidepressants were used to treat cases of depression, and the introduction of muscle relaxants allowed ECT to be used in a modified form for the treatment of severe depression and a few other disorders. The discovery of the mood stabilizing effect of lithium carbonate by John Cade in 1948 would eventually revolutionise the treatment of bipolar disorder, although its use was banned in the United States until the 1970s. From 1942 to 1947, conscientious objectors in the US assigned to psychiatric hospitals under Civilian Public Service exposed abuses throughout the psychiatric care system and were instrumental in reforms of the 1940s and 1950s. The CPS reformers were especially active at the Philadelphia State Hospital where four Quakers initiated The Attendant magazine as a way to communicate ideas and promote reform. This periodical later became The Psychiatric Aide, a professional journal for mental health workers. On 6 May 1946, Life magazine printed an exposé of the psychiatric system by Albert Q. Maisel based on the reports of COs. Another effort of CPS, namely the Mental Hygiene Project, became the national Mental Health Foundation. Initially skeptical about the value of Civilian Public Service, Eleanor Roosevelt, impressed by the changes introduced by COs in the mental health system, became a sponsor of the National Mental Health Foundation and actively inspired other prominent citizens including Owen J. Roberts, Pearl Buck and Harry Emerson Fosdick to join her in advancing the organization's objectives of reform and humane treatment of patients. By the beginning of the 20th century, ever-increasing admissions had resulted in serious overcrowding. Funding was often cut, especially during periods of economic decline, and during wartime in particular many patients starved to death. Asylums became notorious for poor living conditions, lack of hygiene, overcrowding, and ill-treatment and abuse of patients. The prevailing public arguments, time of onset, and pace of reforms varied by country. Class action lawsuits in the United States, and the scrutiny of institutions through disability activism and antipsychiatry, helped expose the poor conditions and treatment. Sociologists and others argued that such institutions maintained or created dependency, passivity, exclusion and disability, causing people to be institutionalised. New Zealand established a reconciliation initiative in 2005 in the context of ongoing compensation payouts to ex-patients of state-run mental institutions in the 1970s to 1990s. The forum heard of poor reasons for admissions; unsanitary and overcrowded conditions; lack of communication to patients and family members; physical violence and sexual misconduct and abuse; inadequate complaints mechanisms; pressures and difficulties for staff, within an authoritarian psychiatric hierarchy based on containment; fear and humiliation in the misuse of seclusion; over-use and abuse of ECT, psychiatric medication and other treatments/punishments, including group therapy, with continued adverse effects; lack of support on discharge; interrupted lives and lost potential; and continued stigma, prejudice and emotional distress and trauma. South Africa currently has 27 registered psychiatric hospitals. These hospitals are spread throughout the country. Some of the most well-known institutions are: Weskoppies Psychiatric Hospital, colloquially known as Groendakkies ("Little Green Roofs") and Denmar Psychiatric Hospital in Pretoria, TARA in Johannesburg, and Valkenberg Hospital in Cape Town. Countries where deinstitutionalisation has happened may be experiencing a process of "re-institutionalisation" or relocation to different institutions, as evidenced by increases in the number of supported housing facilities, forensic psychiatric beds and rising numbers in the prison population. The United States has experienced two waves of deinstitutionalization. Wave one began in the 1950s and targeted people with mental illness. The second wave began roughly fifteen years after and focused on individuals who had been diagnosed with a developmental disability (e.g. Intellectual Disability ). A process of indirect cost-shifting may have led to a form of "re-institutionalization" through the increased use of jail detention for those with mental disorders deemed unmanageable and noncompliant. In summer 2009, author and columnist Heather Mac Donald stated in City Journal, "jails have become society’s primary mental institutions, though few have the funding or expertise to carry out that role properly... at Rikers, 28 percent of the inmates require mental health services, a number that rises each year." In several South American countries, the total number of beds in asylum-type institutions has decreased, replaced by psychiatric inpatient units in general hospitals and other local settings. ^ a b c "Mental Health History Timeline". Studymore.org.uk. Retrieved 15 April 2014. ^ Allderidge, Patricia (1979). 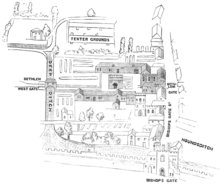 "Management and Mismanagement at Bedlam, 1547–1633". In Webster, Charles (ed.). Health, Medicine and Mortality in the Sixteenth Century. Cambridge: Cambridge University Press. p. 145. ISBN 9780521226431. ^ Stevenson, Christine; Jonathan Andrews; Asa Briggs; Roy Porter; Penny Tucker; Keir Waddington (1997). "The Architecture of Bethlem at Moorfields". History of Bethlem. London & New York: Routledge. p. 51. ISBN 978-0415017732. ^ a b Winston, Mark (1994). "The Bethel at Norwich: An Eighteenth-Century Hospital for Lunatics". Medical History. 38 (1): 27–51. doi:10.1017/s0025727300056039. PMC 1036809. PMID 8145607. William A. White (1920). "Insane, Institutional Care of the, in the United States" . In Rines, George Edwin (ed.). Encyclopedia Americana. ^ "THE FIRST INSANE ASYLUM. ; To Virginia Belongs the Credit in This Country". New York Times. 16 July 1900. Retrieved 1 November 2009. James J. Walsh (1913). "Asylums and Care for the Insane" . In Herbermann, Charles (ed.). Catholic Encyclopedia. New York: Robert Appleton Company. ^ Bukelic, Jovan (1995). "2". In Mirjana Jovanovic (ed.). Neuropsihijatrija za III razred medicinske skole (in Serbian) (7th ed.). Belgrade: Zavod za udzbenike i nastavna sredstva. p. 7. ISBN 978-86-17-03418-2. ^ "Philippe Pinel". Psychology.jrank.org. Retrieved 15 April 2014. ^ Müller, Christian. "Guggenbühl, Johann Jakob". www.hls-dhs-dss.ch (in German). Retrieved 23 June 2016. ^ Roberts, Andrew. "Mental Health History Timeline;1808". studymore.org.uk. Retrieved 24 June 2016. ^ Roberts, Andrew. "Mental Health History Timeline;1811". studymore.org.uk. Retrieved 24 June 2016. ^ Roberts, Andrew. "Index of Lunatic Asylums and Mental Hospitals;1815". studymore.org.uk. Retrieved 24 June 2016. ^ Roberts, Andrew. "The Lunacy Commission, A Study of its Origin, Emergence and Character;Chap.3.1.1". studymore.org.uk. Retrieved 24 June 2016. ^ Roberts, Andrew. "The Lunacy Commission, A Study of its Origin, Emergence and Character;Chap.5.1.3". studymore.org.uk. Retrieved 24 June 2016. ^ Roberts, Andrew. "The Lunacy Commission as a government department". studymore.org.uk. Retrieved 24 June 2016. ^ Shorter 1997, p. 34, 41. ^ "Edouard Seguin (American psychiatrist)". Encyclopædia Britannica. 6 December 2013. Retrieved 15 April 2014. ^ Yanni, Carla (2007). The Architecture of Madness: Insane Asylums in the United States. Minneapolis: Minnesota University Press. ISBN 978-0-8166-4939-6. ^ "Women and Psychiatry - Hysteria, Feminism, and Psychoanalysis". Retrieved 9 July 2016. ^ a b Shorter 1997, p. 35. ^ Suzuki, Akihto (January 1995). "The politics and ideology of non-restraint: the case of the Hanwell Asylum". Medical History. 39 (1): 1–17. doi:10.1017/s0025727300059457. PMC 1036935. PMID 7877402. ^ "British Outsider Art Exhibitions, John Joseph Sheehy London and Group Show in Paris 2008". Retrieved 15 January 2009. ^ a b c Shorter 1997, p. 34. ^ a b c d Shorter 1997, p. 46. ^ Shorter 1997, p. 47. ^ Shorter 1997, p. 48-49. ^ Shorter 1997, p. 65. ^ "by the brooke: lunacy panic". Bythebrooke.blogspot.com. 12 November 2008. Retrieved 15 April 2014. ^ Shorter 1997, p. 190–225. ^ Shorter 1997, p. 226–229. ^ Yanni, Carla. (12 April 2007). The Architecture of Madness: Insane Asylums in the United States (Architecture, Landscape and Amer Culture) (1 ed.). University of Minnesota Press. pp. 53–62. ISBN 978-0-8166-4940-2. ^ World Health Organization. "Eliminating forced, coercive and otherwise involuntary sterilization: an interagency statement" (PDF). unaids.org. Retrieved 23 June 2016. ^ TSUCHIYA, Takashi. "Japanese Eugenic Sterilization, Newsletter of the Network on Ethics and Intellectual Disability, Vol.3, No.1 [Fall 1997], pp.1-4.)". www.lit.osaka-cu.ac.jp. Retrieved 23 June 2016. ^ Torrey E.F.; Yolken R.H. (16 September 2009). "Psychiatric Genocide: Nazi Attempts to Eradicate Schizophrenia" (PDF). Schizophrenia Bulletin. 36 (1): 26–32. doi:10.1093/schbul/sbp097. PMC 2800142. PMID 19759092. Archived from the original (PDF) on 3 August 2012. ^ Semple, David; Smyth, Roger; Burns, Jonathan (2005). Oxford handbook of psychiatry. Oxford: Oxford University Press. p. 6. ISBN 978-0-19-852783-1. ^ Noll, Richard (2007). The encyclopedia of schizophrenia and other psychotic disorders. Infobase Publishing. p. 3. ISBN 978-0-8160-6405-2. ^ a b c d Medicine betrayed: the participation of doctors in human rights abuses. Zed Books. 1992. p. 65. ISBN 978-1-85649-104-4. ^ Birley, J. L. T. (January 2000). "Political abuse of psychiatry". Acta Psychiatrica Scandinavica. 101 (399): 13–15. doi:10.1111/j.0902-4441.2000.007s020[dash]3.x. PMID 10794019. ^ "Press conference exposes mental health genocide during apartheid, 14 June 1997". South African Government Information. Retrieved 16 January 2012. ^ van Voren, Robert (January 2010). "Political Abuse of Psychiatry—An Historical Overview". Schizophrenia Bulletin. 36 (1): 33–35. doi:10.1093/schbul/sbp119. PMC 2800147. PMID 19892821. ^ "Insight on Fluoxetine: the Background and Issues Concerning a Controversial Designer Drug". Personal.umich.edu. Retrieved 15 April 2014. ^ Shorter, Edward (1 June 2009). "The history of lithium therapy". Bipolar Disorders. 11 Suppl 2: 4–9. doi:10.1111/j.1399-5618.2009.00706.x. PMC 3712976. PMID 19538681. ^ Albert Q. Maisel (6 May 1946). Bedlam 1946. LIFE magazine. p. 102. ^ Rochefort DA (Spring 1984). "Origins of the "Third psychiatric revolution": the Community Mental Health Centers Act of 1963". J Health Polit Policy Law. 9 (1): 1–30. doi:10.1215/03616878-9-1-1. PMID 6736594. Archived from the original on 9 July 2012. Retrieved 29 November 2009. ^ "Tara H Moross Centre Hospital - Psychiatric Ward (Ward 8)". Medpages. Retrieved 28 May 2018. ^ Priebe S, Badesconyi A, Fioritti A, et al. (January 2005). "Reinstitutionalisation in mental health care: comparison of data on service provision from six European countries". BMJ. 330 (7483): 123–6. doi:10.1136/bmj.38296.611215.AE. PMC 544427. PMID 15567803. ^ Domino ME, Norton EC, Morrissey JP, Thakur N (October 2004). "Cost shifting to jails after a change to managed mental health care". Health Serv Res. 39 (5): 1379–401. doi:10.1111/j.1475-6773.2004.00295.x. PMC 1361075. PMID 15333114. ^ Mac Donald, Heather. "The Jail Inferno". City Journal. Retrieved 27 July 2009. Yanni, Carla (2007). The architecture of madness: insane asylums in the United States. U of Minnesota Press. ISBN 978-0-8166-4939-6.